home » nature » After the Station Fire: Why is Strawberry Peak Still Closed? After the Station Fire: Why is Strawberry Peak Still Closed? Update May 29, 2014. According to an Angeles National Forest press release issued May 20, nearly all remaining areas in the Angeles National Forest closed since the 2009 Station Fire were reopened on May 24. Some forest areas remain closed for reasons of public safety or further work needed on trails. In addition to the Colby Trail in the area of Strawberry Peak, the closed areas include Lower Gabrielino Trail (below Bear Canyon Trail), Barley Flats Trail, Ken Burton Trail, Millard Water Fall User Trail, Santa Clara Divide Road (FS3N17), Messenger Flats Campground, Lightning Point Campground, and Big Buck Campground. Check with the Forest Service for the most current information. Update May 31, 2013. On May 24th Angeles National Forest quietly extended the closure of the 46,194 acre Station Fire Recovery Area through May 24, 2014. No press release or information regarding the rationale for the continued closure was published on the Angeles National Forest web site. A fire closure of this duration and acreage appears to be unprecedented in California and possibly the U.S. Even in the case of the largest California fires, the Cedar and Zaca fires, closed areas in Cleveland and Los Padres National Forests were reopened within a year of the fire. In many cases fire closures in the National Forests and State Parks of California have been lifted within days or weeks of a large fire. This reflects a general policy that closures of public lands should be implemented and maintained only as a last resort. Update April 16, 2013. Strawberry and Josephine Peaks have now been closed over THREE AND A HALF YEARS. Will Angeles National Forest allow the Station Fire Recovery Area Closure Order to expire on May 24, 2013? Note that none of the trails to the summit of Strawberry Peak are maintained. They are “use” trails — paths that have evolved over time through use. The route to Strawberry’s summit from Red Box is use trail from Lawlor Saddle to the summit; and the routes that ascend the west ridge are use trail above Josephine Saddle. The west ridge also includes some third class rock climbing. It should also be noted there were rescues and other incidents on Strawberry Peak (and in other Forest areas) BEFORE the Station Fire and there will continue to be rescues and incidents. Whether a trail is a good trail or bad trail, accidents can occur and mistakes in judgment can be made. The Forest Service should not keep an area closed without definitive — and supportable — reasons for doing so. Update May 25, 2012. Today Angeles National Forest reopened about 41,000 acres of the Station Fire closure area south and west of Big Tujunga Dam, and extended the closure of the remaining 46,194 acres to May 24, 2013. Newly opened resources include the Stone Canyon Trail, Trail Canyon Trail, and Delta Flat. Condor Peak also appears to be within the open area. According to the updated Forest Service map of the Station Fire Recovery Area (PDF), Strawberry Peak and Josephine Peak are in the area that remains closed. As a result of its relatively easy access, panoramic summit view, varied routes and generally mild Winter conditions Strawberry Peak is one of the most frequented summits in the San Gabriel Mountains. At least it used to be until it was closed by the Station Fire. Here we are, more than two and a half years after the Station Fire, and Strawberry Peak, Josephine Peak and Mt. Lawlor are still closed. Why? The reason might be as arcane as it was simply easier to define the closure boundary as Angeles Crest Highway. It cannot legitimately be claimed that the area was more damaged by the fire. If anything the damage done by the fire and subsequent flash floods and debris flows was greater on the open (south) side of Angeles Crest Highway — between Switzer Picnic Area and Red Box — rather than on Strawberry Peak. It cannot be the progress of recovery. I’ve closely followed the recovery of chaparral following several fires. The photographs and other evidence I’ve seen suggest the chaparral on Strawberry Peak is recovering at an absolutely normal pace. I think many would be surprised to see how far it has come. In fact its regrowth now threatens long established paths and trails. I was under the impression that the route up Strawberry from Red Box was so overgrown and damaged as to be nearly impassable. Apparently that’s not the case. People are doing the peak and based on the reports I’ve read, photos I’ve seen, and firsthand information relayed the trail is in poor condition, but passable with care. There are certainly more hazardous trails and areas in the open areas of Angeles National Forest. That route from Clear Creek also appears to be passable with care. I’m told there’s absolutely no issue on Josephine fire road. The use trail on the western ridge is a little overgrown, but can generally be followed. Apparently a short section of the ridge below the class 3 section is a bit overgrown with Turricula (Poodle dog bush). A little more use and snip here and a snip there would take care of that. Restricted use is an important concern. Having seen the condition of several trails immediately after portions of the Station Fire area reopened, and then a year later, it’s clear to me that use is an essential element of trail health. People using a trail help keep it alive. Conscientious users will pick up litter, remove debris, and do other on-the-go trail maintenance. Use quickly puts the focus on problem areas, and encourages participation when more comprehensive trailwork is done. With the regrowth of the chaparral well underway we are at a critical point in the preservation of the trails and paths in the Station Fire closure area. 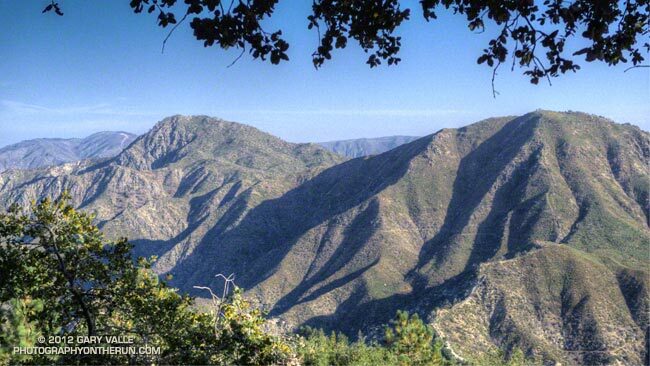 They must be reopened to use — not only on Strawberry Peak, but also on popular peaks such as Condor Peak and Mt. Lukins. If we are not allowed to use the trails, the time and work required to restore them could increase to the point that some trails are lost! The photograph of Strawberry Peak (left) and Mt. Lawlor is from a trail run in September 2011.